From left, Eikei Suzuki, governor of Mie Prefecture, European Council President Donald Tusk, Italian Prime Minister Matteo Renzi, German Chancellor Angela Merkel, U.S. President Barack Obama, Japanese Prime Minister Shinzo Abe, French President Francois Hollande, British Prime Minister David Cameron, Canadian Prime Minister Justin Trudeau and European Commission President Jean-Claude Juncker, participate in a tree planting during a visit at Ise Jingu shrine in Ise, Mie Prefecture, Japan, Thursday, May 26, 2016, as part of the G-7 Summit. ISE, JAPAN (ASSOCIATED PRESS)— Japanese Prime Minister Shinzo Abe and fellow leaders of the Group of Seven advanced economies began their summit Thursday by visiting Ise Shrine, the most hallowed site for Japan's indigenous Shinto religion — one of many aspects of the gathering that dovetail with Abe's long-term diplomatic and political agenda. As host, to the extent that it can, Abe's government has shaped the G-7 program to showcase his own political and economic platform, taking "leadership in guiding the world by showing the best path forward for peace and prosperity," according to an agenda distributed by the Foreign Ministry. The leaders started out their program with a visit to Ise (Ee-say) Shrine, a densely forested, austere landmark that is the holiest site in the Shinto religion. Before and during World War II, Japan's militarist government used Shinto to rally the population behind its invasion of wide swaths of Asia. After Japan's defeat, state Shinto was banned, but the conservative prime minister has used it as a way to promote traditional cultural and social values. The leaders were greeted by Abe and then walked across an arched wooden bridge into the shrine. 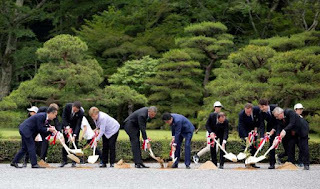 Abe accompanied U.S. President Barack Obama, who was the last to arrive, and the leaders joined a group of children in a commemorative tree planting ceremony. Abe made a visit a day earlier to the shrine to pray for a good summit. Japanese officials said the intent was not to conduct any religious formalities at the shrine but to give the leaders a sense of "air, water, nature and atmosphere." "Ise is the place to present the beauty of nature and the richness of our culture and long tradition," said Foreign Ministry spokesman Yasuhisa Kawamura. The annual summit brings together the leaders of Britain, Canada, France, Germany, Italy, Japan and the United States. After the shrine visit they were due to hold a working luncheon and then tackle a wide range of global issues, starting with the sluggish global economy. Many of the issues to be discussed during their two days of talks are linked to Abe's policy priorities. They include maritime security — code for concerns over China's expanding presence in disputed areas of the South China Sea; initiatives on global health, including funding for fighting terrorism and pandemics; and a focus on women's empowerment, which Abe has promoted as "womenomics." 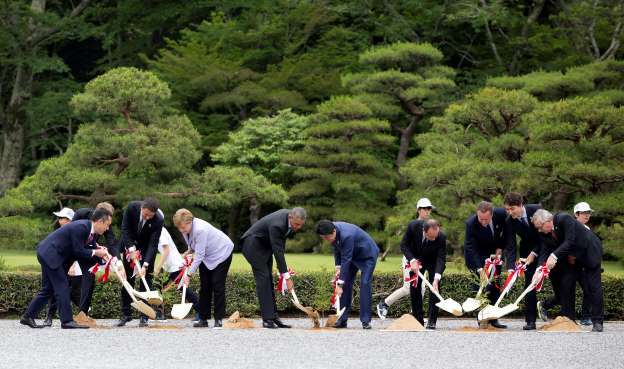 Obama arrived in Japan on Wednesday and had an evening meeting with Abe. After the summit ends on Friday, Obama plans to visit the peace park in Hiroshima, the first sitting U.S. president to visit the city on which the U.S. dropped an atomic bomb in 1945 in the closing days of World War II. Both in the G-7 meetings and in "outreach" sessions with other countries' leaders on the sidelines of the summit, the agenda includes "quality infrastructure investment." Since taking office in late 2012, Abe has circled the globe, visiting dozens of countries to promote sales of Japanese infrastructure technology, especially coal and gas-fired power plants and bullet trains. "We think Japan has demonstrated to the rest of the world what quality infrastructure is like," Kawamura said, "and we're very happy to share our experiences and expertise." The summit is expected, however, to expand support, including development assistance loans, for building roads, power plants and other infrastructure around the world. The Japanese side was seeking a target of $200 billion in financing for such projects. The leaders have other pressing issues to discuss, especially the migrant crisis facing European nations. "Those who criticize us should rather think how to increase their assistance because what Europe provides is already massive," Donald Tusk, president of the European Council, calling for G-7 support and leadership. "And honestly speaking, if they don't take the lead in managing this crisis, nobody else will. I will appeal to G-7 leaders to take up this challenge." Jean-Claude Juncker, European Commission president, noted that a possible exit from the European Union by Britain, depending on a June 23 vote, is also hanging over the talks. "Yes, the general atmosphere of our talks would be better if the U.K. would stay in the European Union," Juncker said. Japanese officials have highlighted joint efforts on the migrant crisis, corruption and terrorism as other top priorities. Initiatives Tokyo is proposing include plans to spend about $6 billion on education, training and job creation for 20,000 people in the Middle East, to help promote development and social stability in the region and counter the chronic unemployment and economic disparities that are contributing to extremism and violence, according to a summary of the plans provided by Japan. On gender issues, Japan plans to help improve schooling conditions for 50,000 girls, mainly in Africa and South Asia, and provide training for 5,000 women in fields such as maternal and child health, it said.